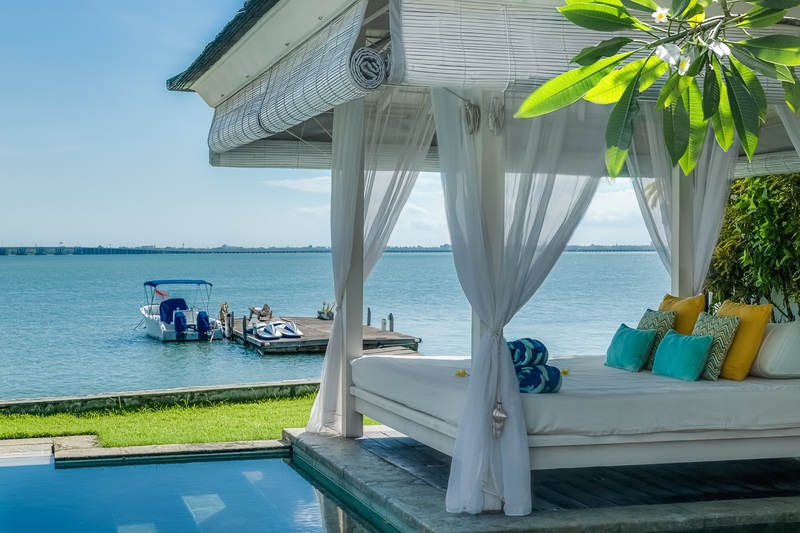 Selamaya in Indonesian means "forever" alluding to the concept of this tropical residence - the pleasure that is meant to never end. 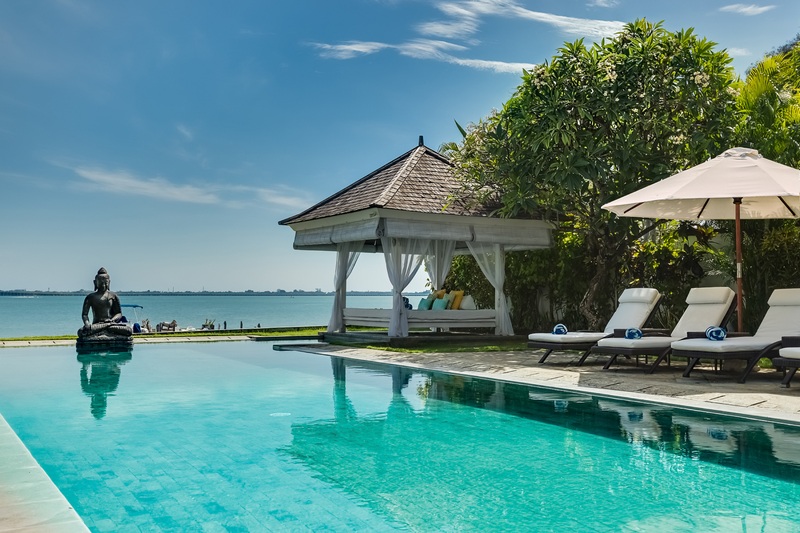 Located on the waterfront of the Puri Tirta Villas complex, in a quiet lagoon of the popular resort area Tanjung Benoa, this villa welcomes its guests with the unforgettable ocean views. 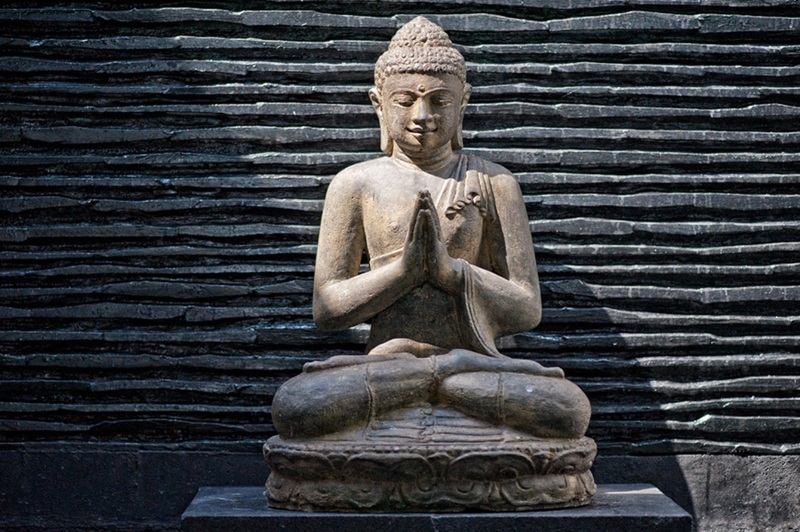 That, and a 20-meter-long swimming pool with Jacuzzi right on the ocean front, cozy pool-side gazebo and the statue of a meditating Buddha overlooking the pool and symbolizing balance and harmony. Modern architecture and minimalistic interiors decorated in wood and stone incorporating traditional Balinese elements blend harmoniously with the tropical greenery and ocean views submerging the guests into the laid-back, peaceful holiday atmosphere and making Selamaya a perfect get-away for a family vacation, a romantic escape or a fun holiday with friends. The bay front of the villas is too shallow for swimming, yet the beach at low tide is perfect for sunrise or sunset walks. 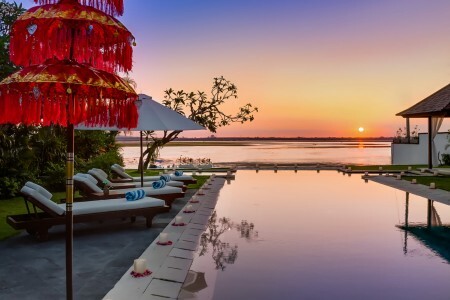 The best beaches, beach clubs, high-end resorts and shopping mall of Nusa Dua are only a short drive away in your personal chauffeured car. 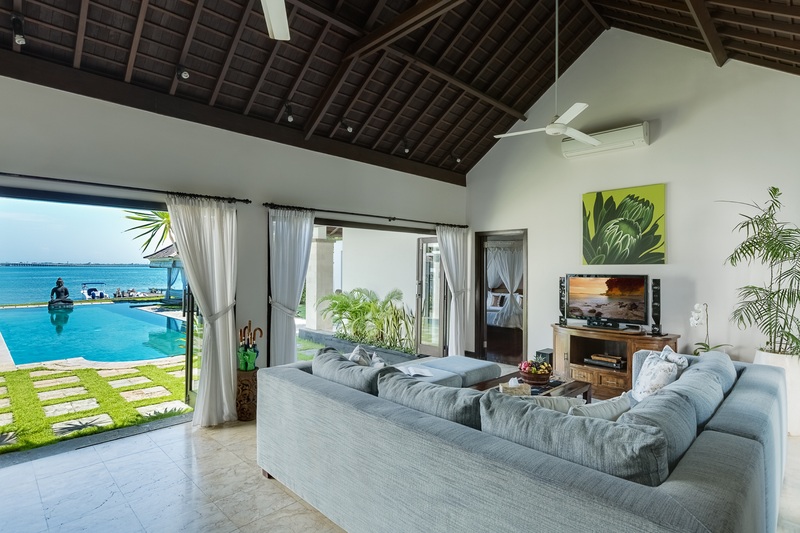 Villa Selamanya is a 2-storey modern building of three bedrooms and a living room, all facing the swimming pool and the water. All decor details are made of wood and stone incorporating traditional Indonesian design elements. The bedrooms and the living room are air-conditioned. 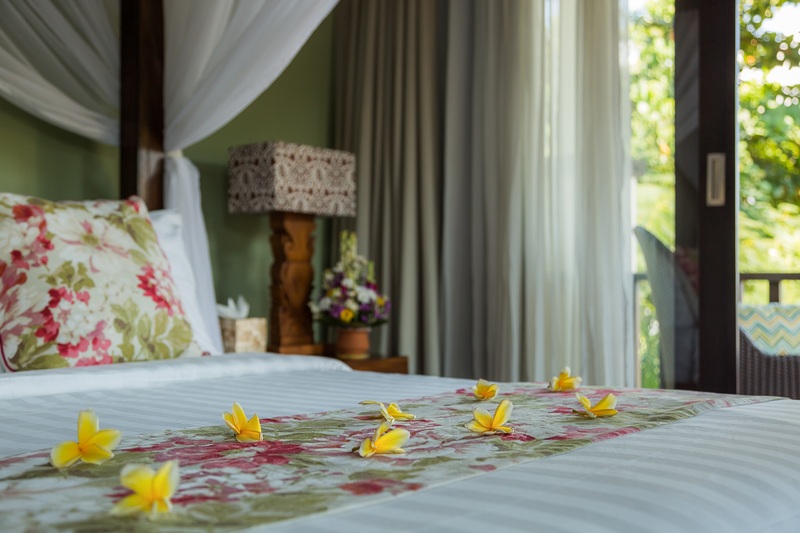 The romantic master bedroom upstairs offers full privacy and carries a four-poster wooden bed, adorned with plentiful pillows in golden sunshine tones. 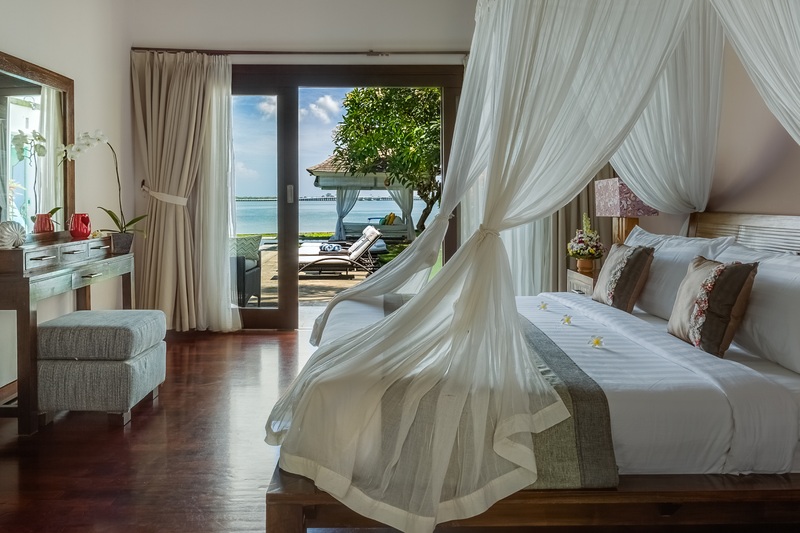 The sliding doors open on to a balcony with a view of the bay with the villas private pier under the palm trees and the swimming pool watched over by a Buddha statue, while the spacious en-suite bathroom offers both indoor and outdoor showers and a built-in closet. 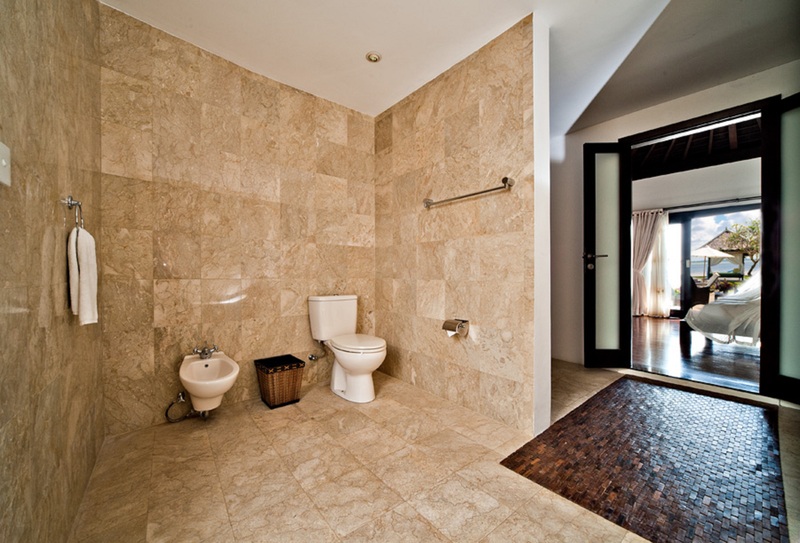 Two other bedrooms are adjacent to the living room downstairs and were built with a family with children in mind. 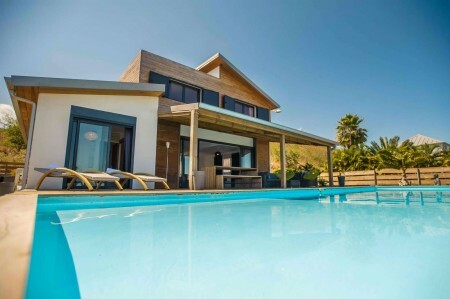 Both of them are en-suite, equipped with a bathtub, indoor and outdoor showers and a built-in closet, and enjoy the view of the pool and the bay. 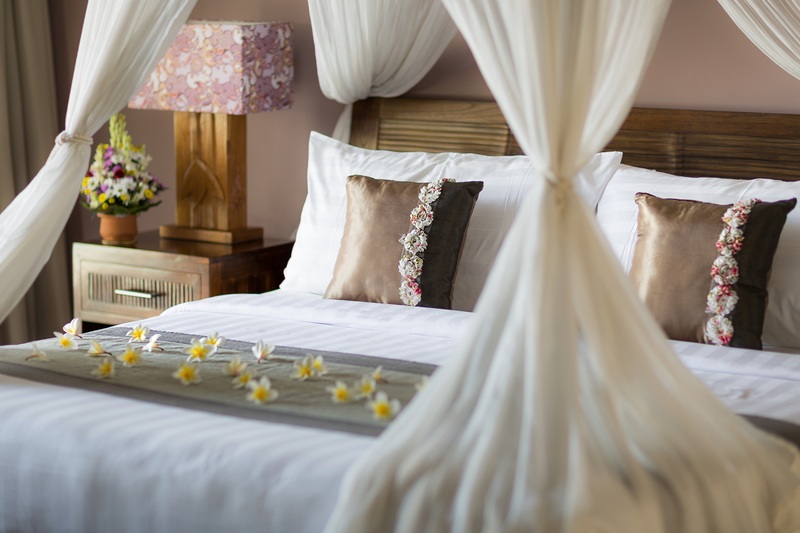 One of the bedrooms, decorated in the shades of crème, is equipped with a king size four-poster bed and an en-suite bathroom. Through the glass sliding doors you get direct access to the pool and the ocean view. Across the living room there is another bedroom decorated in the shades of blue. It has two twin beds that makes it convenient for a family with children or friends. All three bedrooms are air- conditioned and equipped with high quality toiletries, linen, towels and even hair-drier for your comfort. 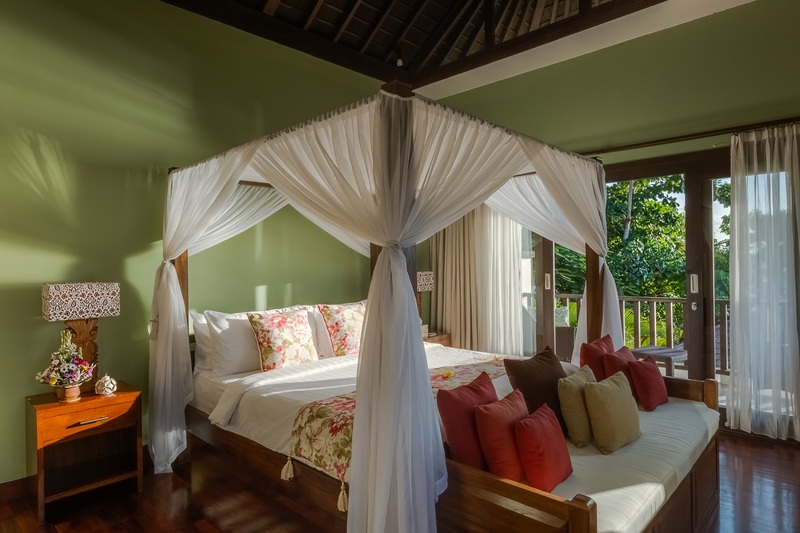 The view will greet you the minute you enter the villa through the Balinese carved wooden gate. 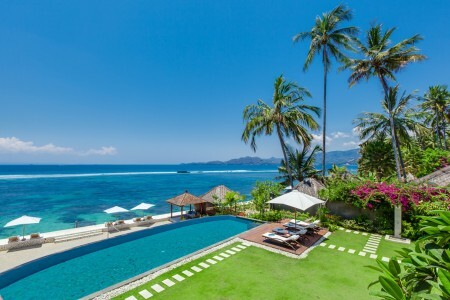 The ocean lies right past the 20 meter-long swimming pool and the adjacent Buddha statue. 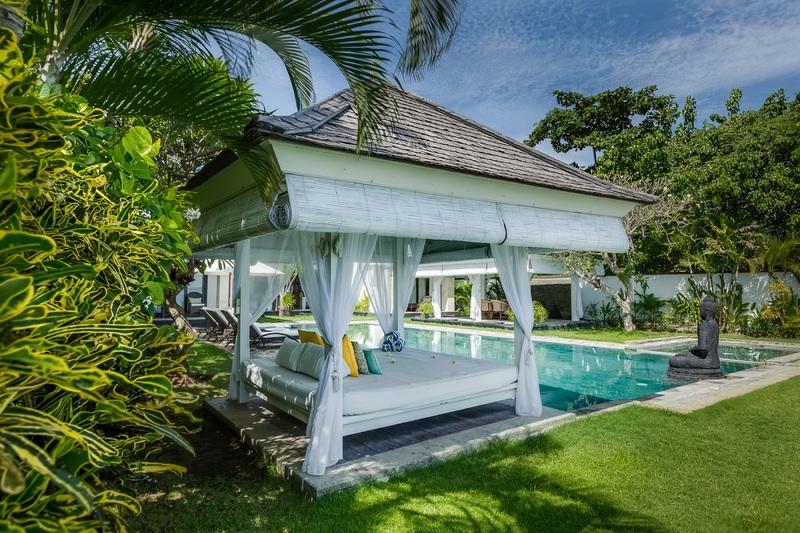 On one side of the pool there is a large terrace complete with sun loungers and umbrellas, and an adjacent ocean-facing gazebo - every guest will find a sunset spot perfect just for them. 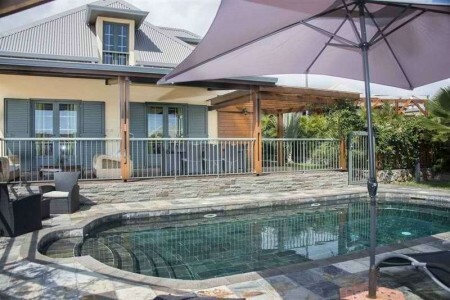 On the other side of the pool there is an open dining room housing a dinner table for six, surrounded by a small pond. 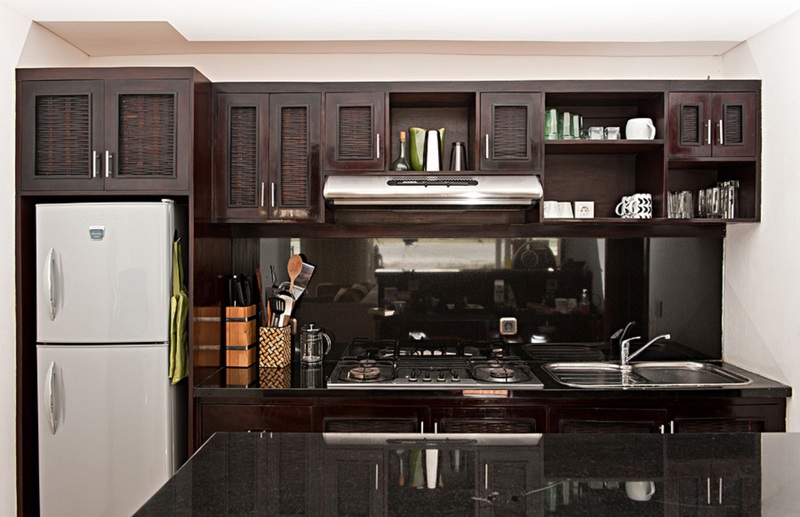 The living room has an adjacent small kitchen equipped with stove, microwave, refrigerator and all the necessary kitchen equipment. The bar stand separating the kitchen from the living-room is a perfect stage to experiment in the art of cocktail-making. 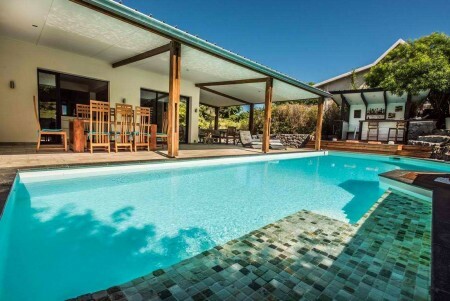 Tall glass sliding doors lead to the swimming pool facing the ocean. 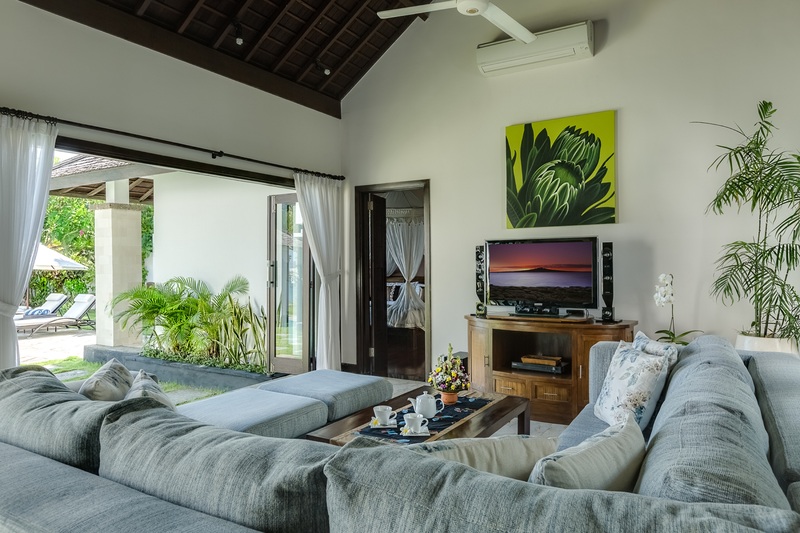 Keep them open in the evening to allow the ocean breeze fill the living room, or close them during the hot tropical day and watch TV, DVDs or listen to music in the comfort of the air conditioned environment. 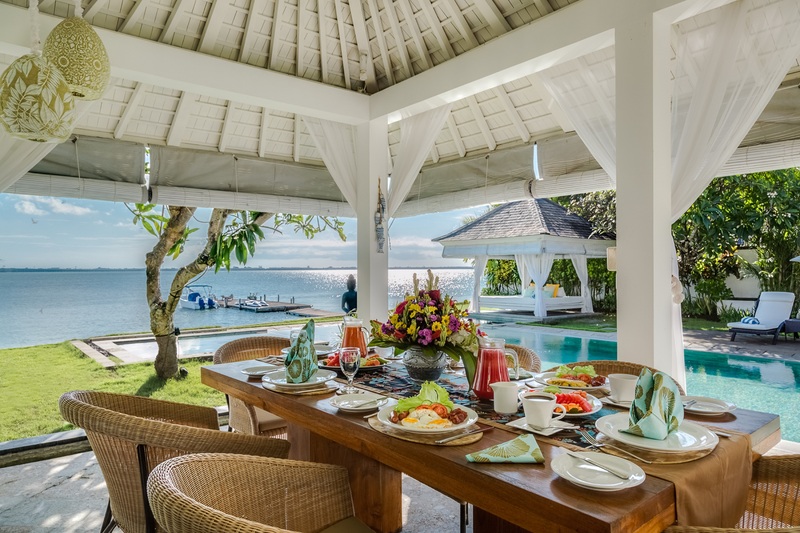 Villa Selamanya is a part of Puri Tirta villas private estate located just near the water on the shore of a peaceful ocean lagoon, only 10 minutes walk from the main street of popular tourist area with many restaurants and amazing spas. 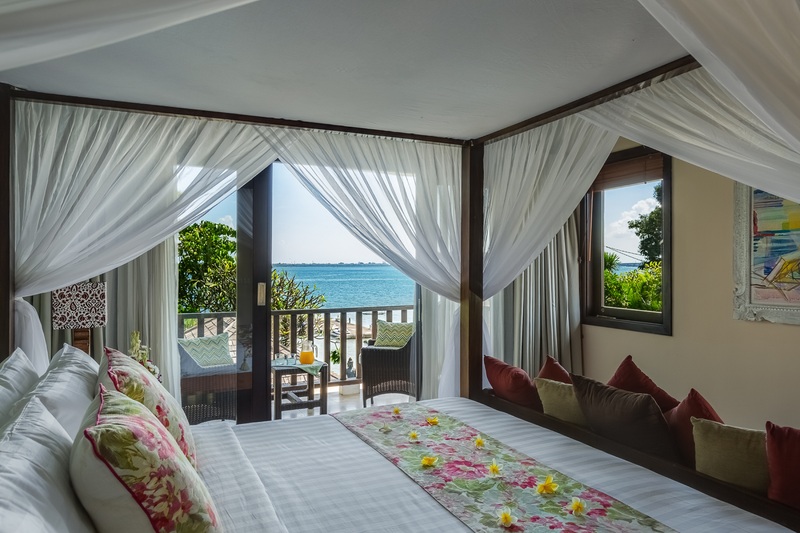 The surrounding area is a water sports paradise and home to some of Bali’s best beaches and world-best four- and five-star tropical resorts all connected by a several-miles long beachfront boulevard suitable for walking or bicycling. This boulevard and all resorts are on the opposite side of the peninsula where Puri Tirta villas estate is located. 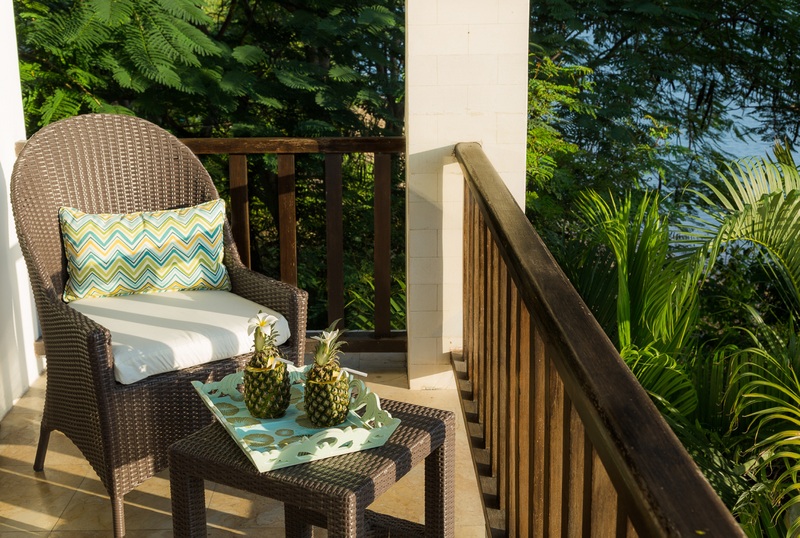 Villa's perfect location on the quiet side of the bay will let you enjoy endless serenity and stay away from the noises of the crowds on land and on water. Another attraction, one-of-its-kind Bali Collection shopping mall, is just 15-minute drive away, and is a perfect place for evening promenades along open-style shopping pavilions surrounded by lush gardens. Here you can also find newly opened The Bay Beach Club with several restaurants and wonderful Pirate Bay playground for kids of all ages. Don’t miss the chance to taste famous crispy duck at a beachfront traditional garden bale of Bebek Bengkil, a restaurant that serves modern Balinese cuisine. You and your kids will definitely enjoy alluring and daring Devdan show representing the cultures of Indonesian archipelago at Nusa Dua Theatre which is located here as well. US$ 535++ in low season US$ 655++ in high season (Easter holiday, 1.July-31.August) US$ 700++ in peak season (20.December-10.January) ++ subject to 15,5% government tax & service charge. Accommodation for 2 persons per bedroom. Maximum one extra child per booking can sleep free of charge in baby cot or in the parent's bed. 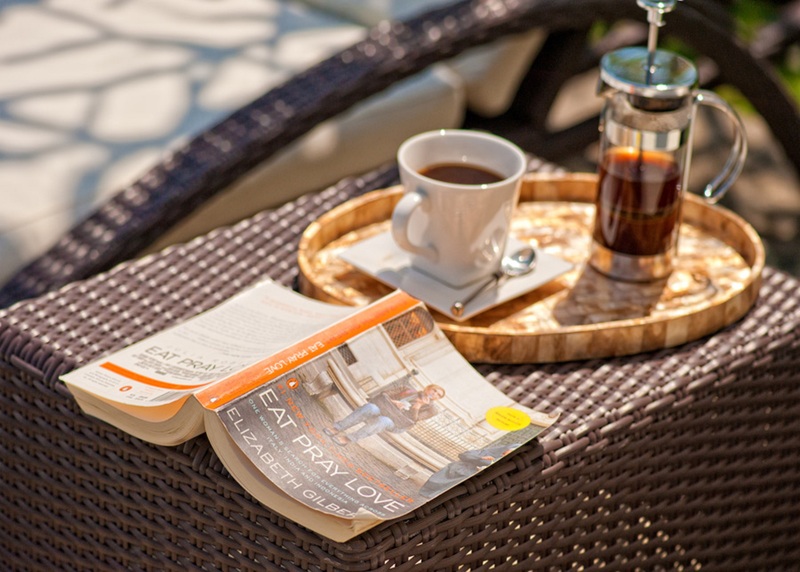 Daily complimentary breakfast for two persons per bedroom. 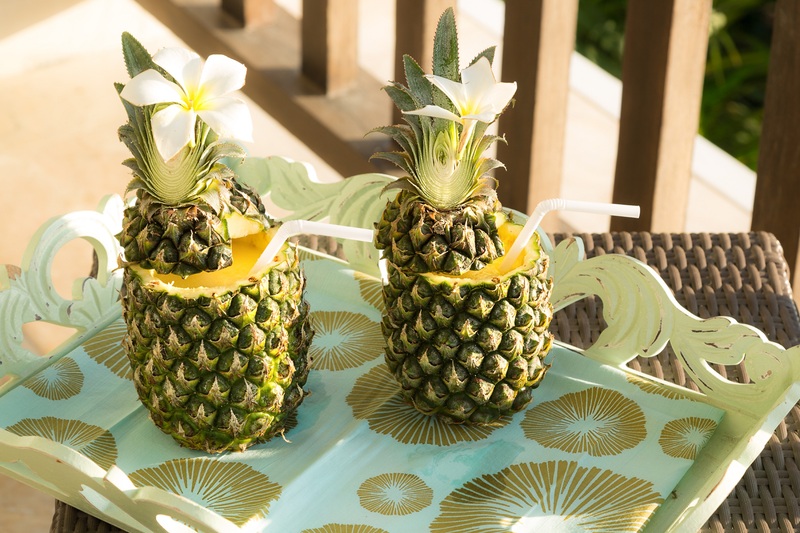 Welcome drinks, fruit basket and chilled towels upon arrival. 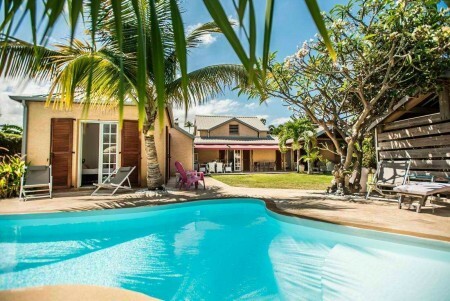 For the whole complex: villa manager; assistant villa manager; 2 butlers; 1 chef and 1 cook; 4 housekeepers; 2 gardeners; 2 maintenance and engineering, include pool service; 3 security guards; 1 driver for each villa during guests stay; babysitter (extra/on request). Daily usage of comfortable 6-seater car with English-speaking driver for eight consecutive hours per day and until 11pm (excluding petrol, parking and toll fees), except day of check-out when the car is provided for complimentary drop-off to the airport or another location nearby, and for direct bookings only. Villa staff can organize additional cars for extended use for a nominal charge. Complimentary cell phone with local sim-card, guests refill the balance base on their usage. Complimentary coffee and tea facilities. Daily afternoon tea (5 o'clock) with home-made or local sweet-stuff. Return airport transfers (for direct bookings). Free usage of estate's kayaks. 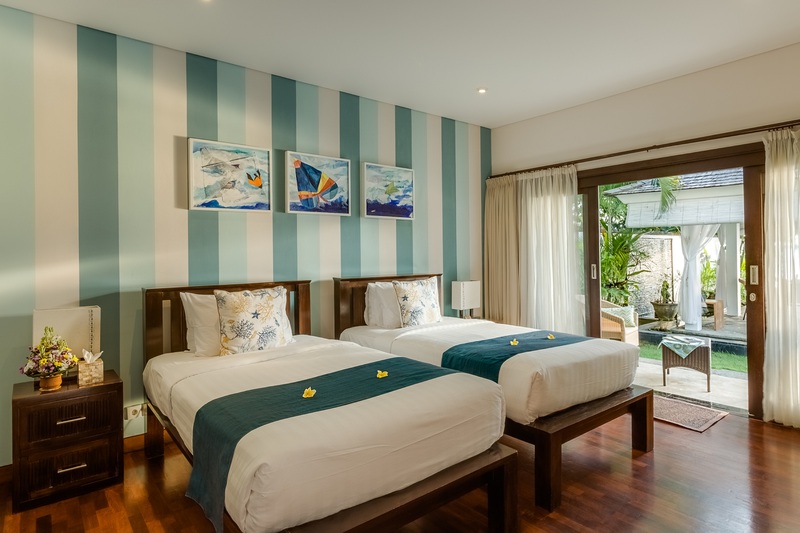 Additional guests surcharge (for every additional person): USD 35 per night, including breakfast and additional roll-way bed; or USD 15 per night including breakfast, for kids under 12 years old if no extra bed provided. 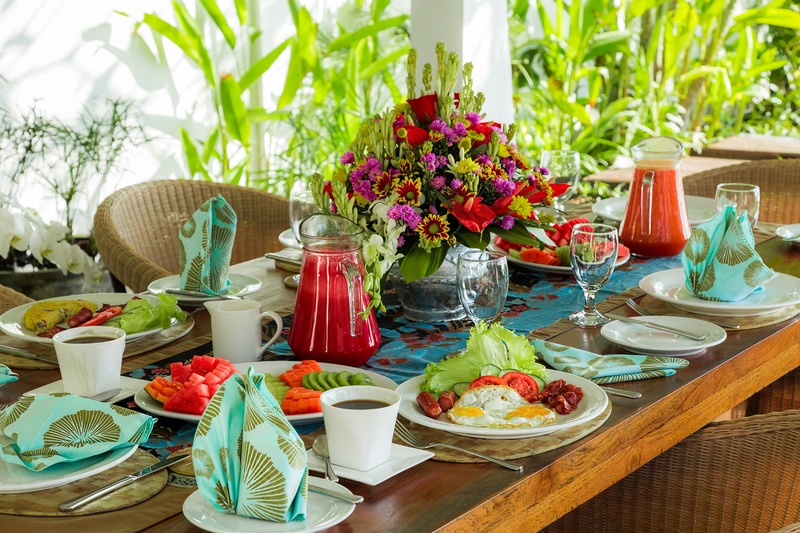 Private chef can be booked for in-villa dinning with cooking fee as 35 USD / lunch or dinner or 45 USD / lunch and dinner plus ingredients by the cost. 800.000 Indonesian Rupiahs (include tax and service charge) per hour include captain and petrol fee (not include fishing rods rent). Minimum booking is 2 hours. Full day boat trips and trolling / coral fishing is available upon request.